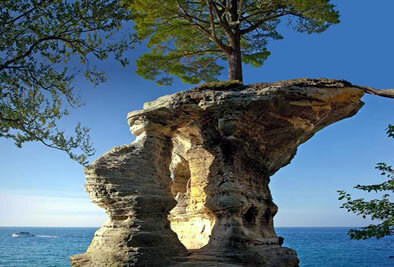 Chapel Rock is located along the coast of Lake Superior in the Pictured Rocks National Lakeshore. It is located about 15 miles east of Munising off Alger County Road H-58, then about a 5 mile drive north to the end of Chapel Road. Once you reach the parking lot it is a 2.5 mile hike to Lake Superior and Chapel Rock. The trails to the beach go past overlooks on Chapel Lake and include views of the beautiful Chapel Falls on the west side. The area was named by early European explorers and is found on early maps as La Chappelle. Chapel Rock is a left over from Cambrian age sandstone. The archway between the rock and the mainland collapsed in the 1940s. 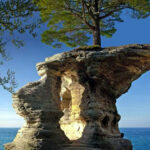 The lone Pine on Chapel Rock is attached to the mainland by its root system. The area is perfect for hikers and boaters to spend time and enjoy the beauty of Lake Superior. There is also a nearby popular backcountry campsite for those who would like to spend the night.